Now Friday rolls around and I am backed into a corner. I have only 45 minutes left in my day to make the card and post it to blogger.... So what's a stamper to do? I just grabbed the stamps that were already strewn on my messy desk, and started with those. This Joseph's Coat/Emerging Color card came out of the mix. Both are really old techniques from the TJ Newsletter... Although this card is funky, I really like it! I'm sure it pales in comparison to my other BC partner's artwork, though. To make the background, I brayered two colors of ink over a matte white cardstock randomly. Then I stamped the medallion with VersaMark, Clear Embossed it, and let it cool. Then I brayered burgundy ink over all that, and wiped the excess ink off the medallions. A few dots of Silver Stickles, and the background was done! I hope you enjoy my "because it was on my desk" resist card...if you have a few minutes, take a look at the other cards from the rest of the BC players (in my left sidebar). All stamps, Stampin' Up! ; the Silver medallions are from Club Scrap. This week's Wonderful Wednesday Giveaway caused me to take a moment and think about what inspires me. 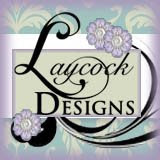 You see, the stamps for this week's giveaway are from Innovative Stamp Creations, and the artist for the stamps is Cindy Roland! I consider BOTH Betsy Griffin from ISC and Cindy inspirational and I am thrilled to be able to offer these stamps for the giveaway. 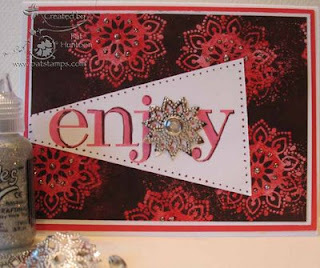 The card I made for the sample uses the Color Collage Technique from the April 2008 issue of the Technique Junkie Newsletter. 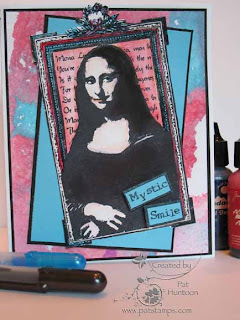 The cool thing about using this technique with these stamps is that Cindy Roland was the originator of the Color Collage Technique! This inspirational 4-1/2" x 8" sheet of rubber is called "Thoughtfulness." It is one of the new stamp sheets offered by ISC. Did you know that if you buy any of the Background Series from ISC, you will always receive a complimentary set of stamps? Some ideas for you: Batik Flowers, WoodGrain & Artsy Victorian - both woodgrain and artsy Victorian were also used on the card above, too. Oh, and Betsy also has the 15% off all Grungeboard, and 30% off all DreamKutz on her site right now, too. ANYONE can enter this give away.One entry per person, per give away, please. To enter the give away for today, simply leave a comment on this blog entry telling me that you would like to enter by 11:59pm EST on Sunday, June 29th. No other entry methods will be included in the give away. If you email me to enter, your entry will NOT be considered a valid entry. When you leave the comment, make sure to put your NAME in the comment -- if you enter your comment as "Anonymous", I cannot give you the prize! Blogger does NOT record your email address for me, so you will need to check back to find out if you have won or include your email address in your comment so that I can notify you. A good way to do this is like so: phuntoon at optonline dot net -- it will help protect your privacy! I will have a random number generator pick one number from the comments to select one winner. Each give-away is separate, so to be eligible for a specific item you must enter that day's contest on the post where it is listed. Enter today -- good luck! I have blog give aways every Wednesday -- come play! Congratulations to Mary Garvey, the winner of this giveaway! It was pointed out to me that I had posted the " Buy One, Get One Half Off" (BOGO) information to the e-group, but I had not posted it to my blog. 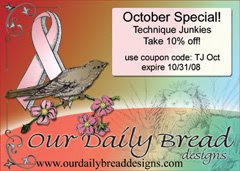 You do NOT need to be a current Technique Junkie Subscriber to take advantage of this sale. Here is the pricing for the sale – if you are interested, let me know what you would like and I will send an invoice from PayPal, you can send a check to the address below, or I can take a credit card through email (send the credit card number and the expiration date in two separate emails, along with your complete address on the second). A list of what is in each newsletter and CD is here. Thanks! This offer ends June 30th, so take advantage of it today! Thanks, ladies, for your support! The sale is now over. Rare Images, indeed! Nancy Judd, Technique Junkie designer and stamper extraordinaire, is the maker of this fine piece of rubber. Nancy was looking for good dog and cat stamps and couldn't find any that she was happy with. So what is any self-respecting designer/stamper/TJ-er to do? Why, you make your own stamps! At least, that is what Nancy did. I am thrilled to offer these stamps from Rare Images for the Wonderful Wednesday Giveaway this week. 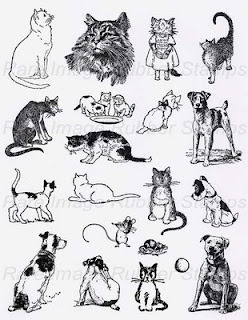 The winner of this Rare Images stamp sheet will receive the 8-1/2" x 11" sheet above that is filled with dog, cat and mice images. If you would like to purchase the stamps directly, go to Nancy's Blog and click on the sheet in the right column -- it will take you to her store. In addition to these great stamps, the winner of the giveaway will receive the card above. The dog is colored using the Marker Water Coloring Technique from the June 2008 issue of the Technique Junkie Newsletter. (You thought I used my Copics to color him, didn't you? Look at that! Regular ol' markers -- if you subscribed, you would know the trick to doing this...) The purple/green/gold background was made using a technique called Faux Handmade Paper, also from the June issue. 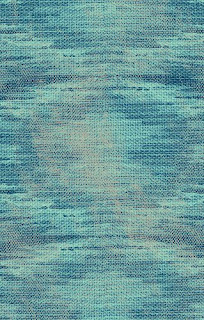 Finally, all of those pieces are layered on a piece of Textured Pearl Ex from the December 2006 issue of the Newsletter. Okay, want to know how the stamps and cards could be yours? ANYONE can enter this give away.One entry per person, per give away, please. To enter the give away for today, simply leave a comment on this blog entry telling me that you would like to enter by 11:59pm EST on Sunday, June 22nd. No other entry methods will be included in the give away. If you email me to enter, your entry will NOT be considered a valid entry. When you leave the comment, make sure to put your NAME in the comment -- if you enter your comment as "Anonymous", I cannot give you the prize! Blogger does NOT record your email address for me, so you will need to check back to find out if you have won or include your email address in your comment so that I can notify you. A good way to do this is like so: phuntoon at optonline dot net -- it will help protect your privacy! I will have a random number generator pick one number from the comments to select one winner. Each give-away is separate, so to be eligible for a specific item you must enter that day's contest on the post where it is listed. Enter today -- good luck! I have blog give aways every Wednesday -- come play! The winner of these stamps is Sandi Figura! 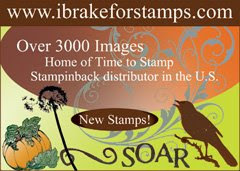 Congratulations to Shirley Wilson, the winner of the I Brake for Stamps Giveaway on my blog last week. Check in Wednesday for more giveaways and YOUR chance to win! Today's Blogger's Challenge was to use the color combination of Green, Pink and Turquoise. While I was tempted to grab some flowers, I have been drawn to these cool stamps from Starving Artistamps all week long. 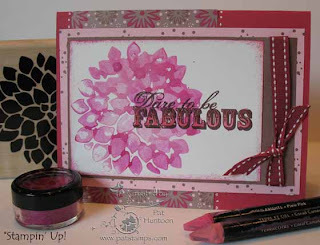 I just kept thinking that I wanted to turn these Doodle Factory: Urban stamps into something girly. Cool, hip, phun and phunky girly. Hence my creation today! Originally I had hand-wrritten "Girlz-Rool" in the banner, but I didn't like the way it looked, so I stamped this saying from Close To My Heart. In any case, I colored it all with Copic Markers, I am working on perfecting my technique in using them, so bear with me. Heck, I even dug out a cloud stencil! Check out the entries from the other BC players, listed in my sidebar. Hope you have a phun weekend! Background and Siggy File - Do not delete, Do not publish! Today is a "times 2" giveaway -- We are giving away these two wonderful women from I Brake for Stamps. The two stamps today's lucky winner will receive are Mona Lisa, and the Geisha, along with the two cards shown here. 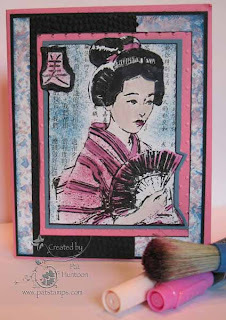 Each of these images are bigger than they appear here -- Mystic Smile is 2-3/4" x 4-3/4", and The Geisha Collage is 3-1/4" x 4-1/4". 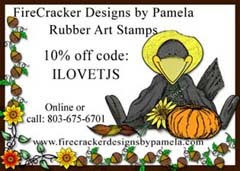 ...And because I Brake for Stamps is so generous, these stamps are on sale for us this week at 40% off -- plus there is so much more there on sale for 25% - 35% off, too... Click here for the sale page. It just so happens that there is a terrific technique coming in the August issue that woks best with these collage-style images, too. Since today kicks off the Technique Junkie Newsletter "BOGO Sale" (Buy One, Get One Half Off), I thought it was fitting to show some new art using older techniques, and to show some with new techniques, too. The best thing about this is that all of these techniques are TIMELESS -- you can use them today and your artwork is still current! 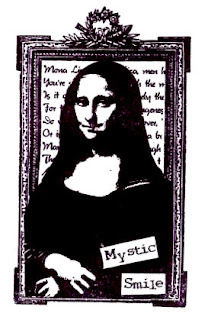 The Mystic Smile Card card to the right features the AI Float Technique (June 2008 Technique Junkie Newsletter, courtesy of Ann Clack) in the background. The main image is colored with Markers, Gamsol Pearls, and Sakura Glaze Pens (I have been using this ALOT recently). She's a little sparkly, too, since I popped some glitter pen around her edges. The other card to be given away takes us WAY back. 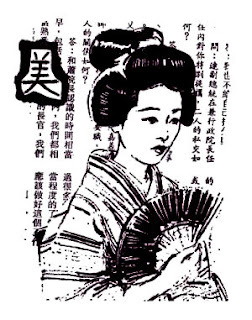 The geisha image on the left was colored with a combination of stippling and markers. The Out of the Box Technique (October 2004 NL) was used to highlight the image. To really time travel, I used the Saran Wrap Technique on the background of this card -- its one of the online-bonus techniques on the 1st edition CD, published in 2003. Why not add that CD to your BOGO list!?! ANYONE can enter this give away.One entry per person, per give away, please. To enter the give away for today, simply leave a comment on this blog entry telling me that you would like to enter by 11:59pm EST on Sunday, June 15th. No other entry methods will be included in the give away. If you email me to enter, your entry will NOT be considered a valid entry. When you leave the comment, make sure to put your NAME in the comment -- if you enter your comment as "Anonymous", I cannot give you the prize! Blogger does NOT record your email address for me, so you will need to check back to find out if you have won or include your email address in your comment so that I can notify you. A good way to do this is like so: phuntoon at optonline dot net -- it will help protect your privacy! I will have a random number generator pick one number from the comments to select one winner. Each give-away is separate, so to be eligible for a specific item you must enter that day's contest on the post where it is listed. Enter today -- good luck! I have blog give aways every Wednesday -- come play! Congratulations to Shirley Wilson, who is the winner of this Giveaway! I think I have mentioned this once before, but if you have any weight struggles and would like to watch my journey and travel along with me, I have a weight-loss blog dedicated to it. It is HERE. I have to tell you that the entire time I was making this card, that was going though my head! 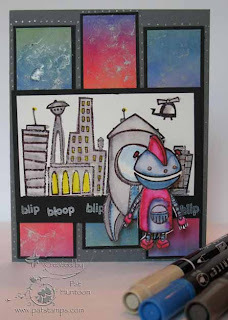 These outrageously fun stamps are from the DoodleFactory: Urban stamp sheet from Starving Artistamps. I was at a stamp show on Saturday and got this -- I just love this sheet and couldn't wait to play with it! I colored my robot scene using the Marker Water Coloring technique from the June 2008 edition of the Technique Junkie Newsletter. I think it is remarkably similar to the look achieved by coloring with Copic Markers (I have more of those, now, too, thanks to Saturday's shopping spree). It's alot easier, and alot less expensive, with regular markers, though! The strips on the background were done using the Polished Rainbow technique from the April 2007 issue of the newsletter, and I did a little Rainbow Strip Flip Technique on the pieces (from the June 2005 issue of the newsletter). The spaceship is popped up, and the robot is popped higher than that -- it is very dimensional in person. It's a tiny bit glittery, too -- I added accents with a gelly glitter pen -- but they didn't up with the picture. One of these days I will do them as they are intended...Check out Mary Jo Price William's site for the other players -- she updates it all week. 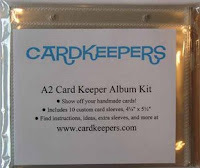 Deanna Amundson is the winner of the Card Keepers Giveaway~ Congratulations, Deanna! First, Life IS Good! And I should never forget that. I am blessed and happy. I am well-fed, well-loved, creatively satisfied. Life is good. Second, this card may be Black and White, but not everything else is! Hope your weekend is wonderful. I am going to a stamp convention to spend time and money with friends. What about you? Check out the posts from the other Blogger's Challenge Players - they are listed in my sidebar. Wonderful Wednesday Give Away - Cardkeepers! I love give away Wednesdays, and this one is doubly special. I know you are going to adore this! This week our giveaway is sponsored by http://www.cardkeepers.com/. 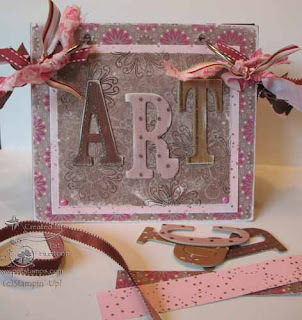 The Cardkeeper Kit is perfect to make your own album for holding standard handmade greeting ards (A2 size, or 4.25" x 5.5"). Show off the cards you make, the cards your friends send you, or the cards you receive from swaps. The Card Keeper album also works great as a mini scrapbook, recipe book, or whatever else you can come up with. If you are the lucky winner of the giveaway today, you will have a choice -- you can either have the "naked" cardkeeper Kit so that you can alter it to your own taste, or you can choose to take the kit I made as shown. Either way, your kit will come with the card shown below. 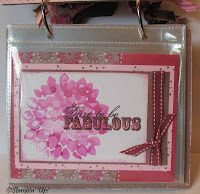 My kit was altered using Designer Paper from Stampin' Up!. To make this, I cut the paper to size and distressed it with a sanding block. Then I simply used Perfect Paper Adhesive to attach the paper to the front, back and inside panels. Note: You don't have to use PPA to attach the paper to the chipboard front and back. I chose to because I like the way it looks when the piece is finished. The brown panel on the front uses the Vanilla Double Technique from the October 2005 issue of the Technique Junkie Newsletter. I finished my kit by attaching a few chipboard letters, tied some ribbon onto the "O" Rings, slid them though the pre-drilled holes, and Viola! My Cardkeeper kit was done. The card above will be mailed to the winner of the giveaway whether or not they choose the pre-altered or unaltered Cardkeeper Kit. 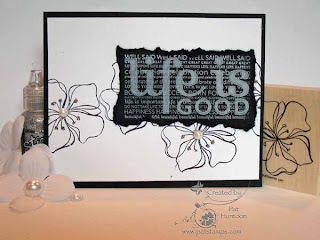 The card uses the same designer paper from Stampin' Up!, and the main Flower image is colored using the Twinkling Water Colors Technique from the June 2008 issue of the TJ Newsletter. Okay, want to know how the kit and card could be yours? ANYONE can enter this give away.One entry per person, per give away, please. To enter the give away for today, simply leave a comment on this blog entry telling me that you would like to enter by 11:59pm EST on Sunday, June 8th. No other entry methods will be included in the give away. If you email me to enter, your entry will NOT be considered a valid entry. When you leave the comment, make sure to put your NAME in the comment -- if you enter your comment as "Anonymous", I cannot give you the prize! Blogger does NOT record your email address for me, so you will need to check back to find out if you have won or include your email address in your comment so that I can notify you. A good way to do this is like so: phuntoon at optonline dot net -- it will help protect your privacy! I will have a random number generator pick one number from the comments to select one winner. Each give-away is separate, so to be eligible for a specific item you must enter that day's contest on the post where it is listed. Enter today -- good luck! I have blog give aways every Wednesday -- come play! Congratulations to Deanna Amundson, the winner of this give away! I feel so guilty! 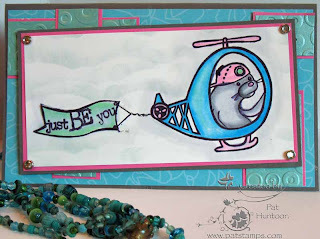 I haven't participated in a Technostamper Sketch Challenge for a few weeks and I feel like I have been letting my friend Mary Jo Price-Williams down. Now this one is late! Oh well, we all do our best, right? I love this sketch. Very easy! It also showcases the Faux Handmade Paper background off really well, too. 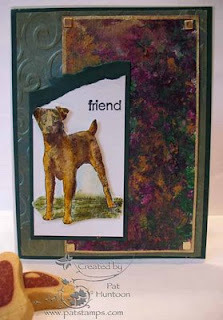 The Faux Handmade paper technique can be found in the newest edition of the Technique Junkie Newsletter. 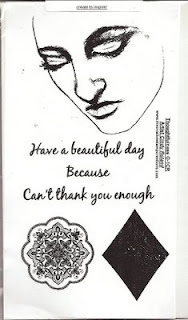 All stamps used for this card are from Stampin' Up!. The medallion is from the True Friend set, and the words are from my cut-up Happiness background. If you need more info on how and why I cut up the background, and what I mounted it on, click HERE. For information & to see this week's sketch, check out Mary Jo's BLOG. 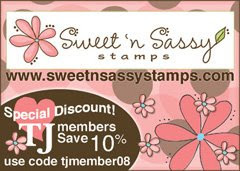 Phyllis has won the Sugar Shoppe Stamps from the giveaway this week -- congrats!